Japan's NHK runs 8K trials at Wimbledon 2015 | What Hi-Fi? Japanese broadcaster NHK (Nippon Hoso Kyokai) is filming in 8K on No.1 Court at Wimbledon as it prepares for the 2020 Olympics. You won't be able to see the footage anywhere publicly as the 8K feed is being sent to a dedicated theatre on top of Wimbledon's broadcast centre, and is only available to broadcast professionals. 8K (or Super Hi-Vision) delivers four times the resolution of Ultra HD 4K and 16 times that of standard high definition. NHK is planning to broadcast the 2020 Tokyo Olympics in 8K. 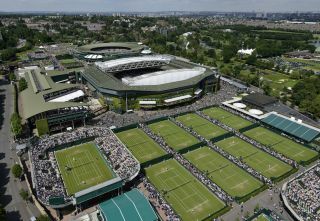 At Wimbledon, the broadcaster is using four cameras, according to SVG Europe: two Ikegami 8K SHV-8000s, one Sony F65 4K and one For-A FT-ONE 4K camera. Upconversion is used on the two 4K cameras to create the 8K feed. NHK is filming two matches each day throughout the tournament, up until the last four days. Trial broadcasts are due to begin next year. It has previously run 8K trials at the London Olympics in 2012, the Sochi Olympic Games and the 2014 FIFA World Cup in Brazil.